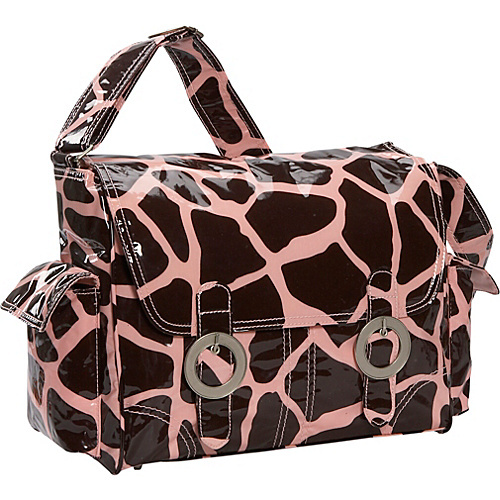 Keep your little one’s necessities neatly and stylishly together using the Giraffe Kalencom Coated Double Buckle Diaper Bag. This sturdy yet lightweight and water-resistant coated cotton diaper bag boasts flap-over construction with contrast-stitched detail and a bold, graphic, screen-print pattern, and it’s available in several designs. It has magnetic clip closures, and it boasts a roomy, easy-to-clean, lined interior that contains a fold-out changing pad in its own compartment; a coordinating zippered pouch; an insulated, matching bottle bag; organizational pockets; and elastic bottle loops. Its open back and side flap pockets offer quick access to frequently-needed things, and it comes with an adjustable shoulder strap. Polyurethane exterior coating makes clean up a snap! AZO Free. We use no Phthalates/DEHP, DBP, or BOP in our PVC.